Façades around town burst with color and character, especially in the city’s older neighborhoods. Bright shutters hang against Caribbean-toned homes. But something else has been slowly, yet steadily, taking root and surfacing across town: murals. 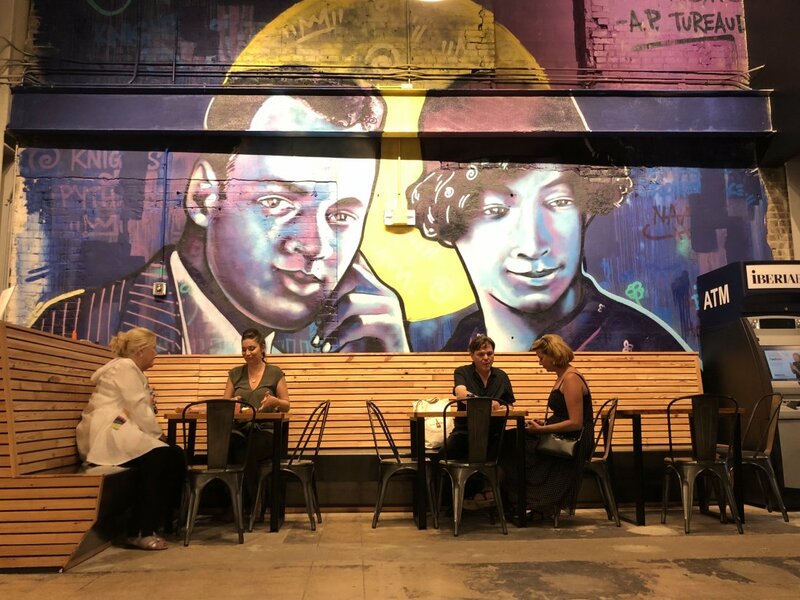 New murals that touch on local history, notable figures, and jazz music now adorn walls and demand an audience. Read on to learn about some of the city’s newest murals—and make plans to view them in-person. Little Gem Saloon: 445 S. Rampart St. The Little Gem Saloon operated as a jazz club from 1903 to 1909 in one of the city’s most historically significant areas for jazz—the 400 block of South Rampart Street. During that time, it hosted jazz legends such as Jelly Roll Morton, Freddie Keppard, and Buddy Bolden. Now, a new mural by Brandan “Bmike” Odums is emblazoned on the side of the reestablished Little Gem Saloon. 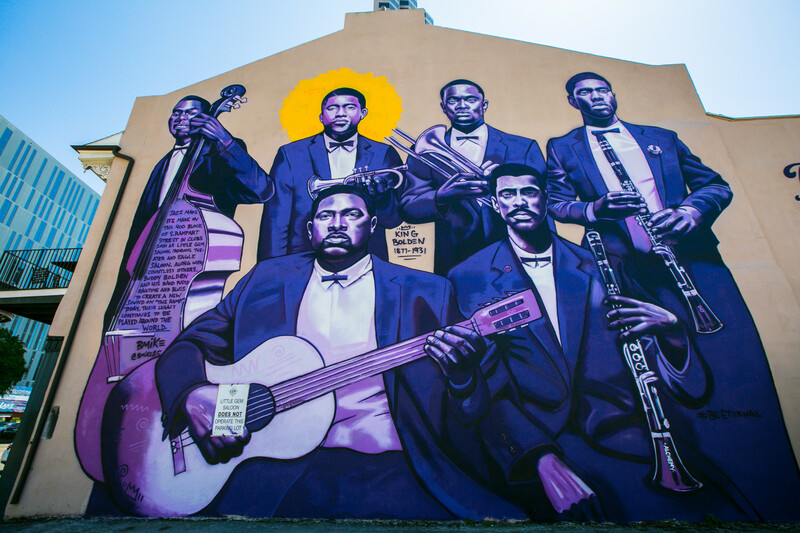 Commissioned by the New Orleans Tourism Marketing Corporation, the mural portrays Buddy Bolden, an almost mythical jazz legend with no known existing recordings, his only remaining depictions in grainy photographs. Odums brings Bolden to life, along with fellow musicians, by using his own friends’ faces. The halo motif, a common sight in Odums work, remains unfinished around Bolden’s head, a visual representation of the musician’s struggles with mental illness and alcoholism. The mural is part of the “One Time in New Orleans” campaign, celebrating the city’s Tricentennial. The New Orleans Jazz Market, in Central City, recently debuted a mural on its exterior by New York artist and illustrator Timothy Goodman. 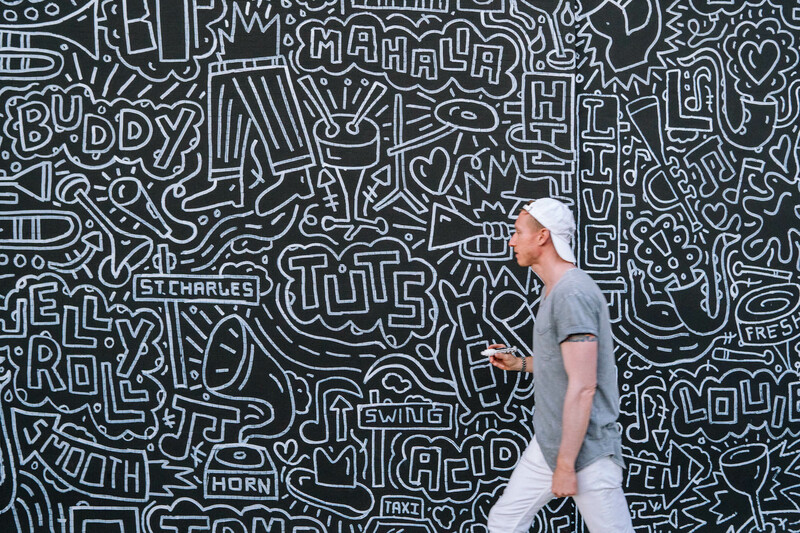 The monochromatic mural, created under the influence of live music from Trumpeter Glen Hall III of Bad Boyz Brass Band, celebrates New Orleans’ Tricentennial. Like jazz itself, Goodman improvised the mural while drawing, further illuminating the history of jazz depicted in the mural. This mural is part of the New Orleans Tourism Marketing Corporation’s “One Time in New Orleans” campaign. The “These Are Times” mural by artist Ayo Scott is strategically placed. The 2,685 square foot mural is painted only steps from where Homer Plessy, a Creole of color, was forced off of a railway car and arrested for sitting in a “White” car. This planned act of civil disobedience led to the Plessy v. Ferguson U.S. Supreme Court case which resulted in the “separate but equal” doctrine that permeated the South throughout the Jim Crow period. 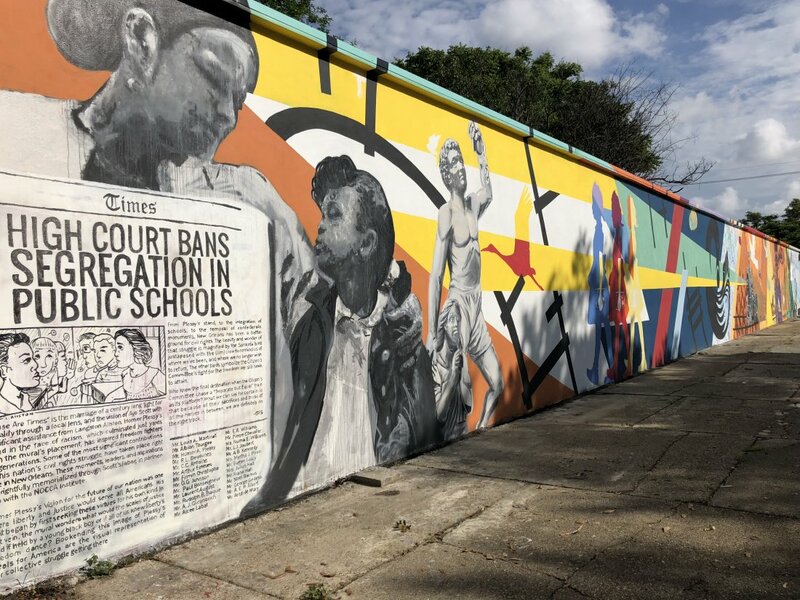 From Plessy’s stand to school desegregation, the mural itself is a visual history of the numerous steps toward equal rights for African-Americans that took place in New Orleans. As Scott states in the language built into the mural, it ultimately serves “to remind us of where we’ve been, and where we no longer wish to return.” The NOCCA Institute commissioned the mural which debuted in late May. The Pythian Market, part of a massive renovation of the old Pythian Temple building, opened in May. Commissioned by the Colored Knights of Pythias, a fraternal organization, the structure’s history has been intertwined with local African-American history since the cornerstone was laid in 1908. The NAACP and local African-American newspaper The New Orleans Herald (now The Louisiana Weekly) both had offices there. Today, though, a new mural by Brandan “Bmike” Odums, is tucked amidst the food stalls. Depicting local civil rights attorney A.P. Tureaud and his wife Lucille Dejoie, the piece evokes a small part of the building’s history: Tureaud and Dejoie first met in the Pythian’s rooftop jazz garden in the late 1920s. Scrawled above the couple’s heads is a Civil Rights era quote by A.P. 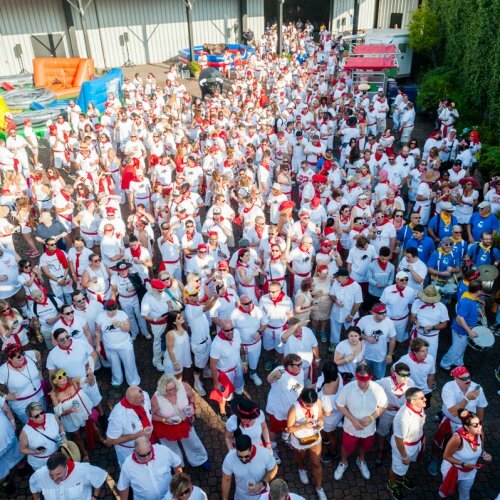 Tureaud: “Resist, by all lawful means, any and all efforts to deny us our rights.” The Pythian is open daily. The construction of the elevated expressway that runs along Claiborne Avenue decimated a thriving African-American commercial district in the 1960s. 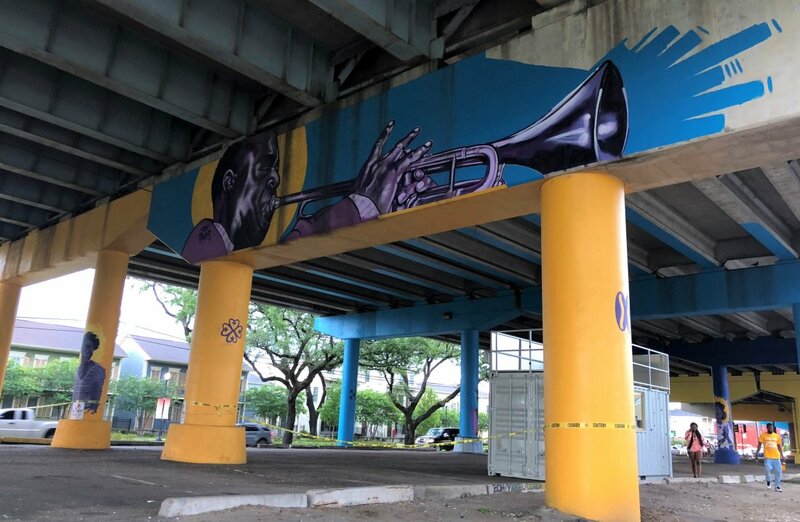 Recently the 25-block span between Canal Street and Elysian Fields Avenue was dubbed the Claiborne Corridor Cultural Innovation District with plans to reinvigorate the surrounding neighborhood by hosting special events, businesses, and educational programming. Artists came together in 2002 to paint beneath the interstate—including imagery of oak trees lost to the urban renewal. Those paintings are still there, but recently, as part of the effort to infuse new life to this space, local artists like Bryan Brown, Langston Allston, and about a dozen others have picked up their paint brushes. The newest murals depict monumental figures in the local African-American community, people like the beloved Mardi Gras Indian Allison “Tootie” Montana, the late singing produce vendor Mr. Okra, and gospel singer Mahalia Jackson.